In this workshop teachers will acquire a bank of open-ended prompts to inspire and excite their young writers to get words on the page. We will then explore some key feedback cues that lead to students embracing a problem-solving approach to redrafting. Some myths about writing and the teaching of writing will be busted! For a long time Heather McQuillan was a teacher who wrote, now she is a writer who teaches. 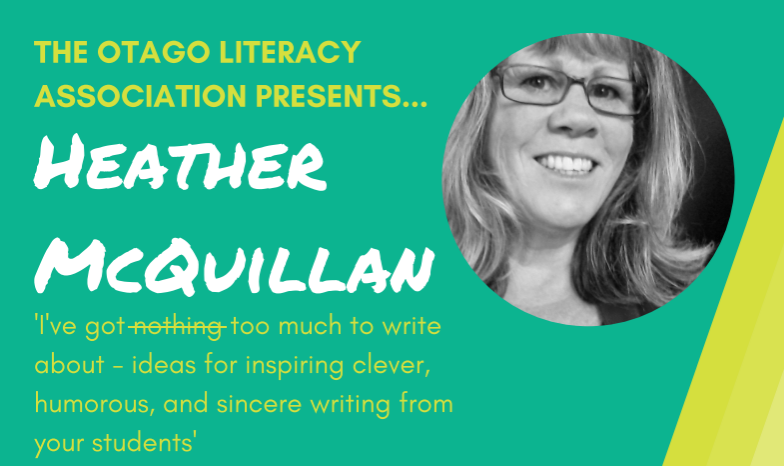 Through her work as Director at The School for Young Writers in Christchurch, she works with hundreds of young writers every year and also helps teachers to develop their understanding of the writing process and ways to guide young writers. Heather has a Master of Creative Writing and is an award-winning writer of short fiction and children’s novels. She won the Tom Fitzgibbon Award in 2005 for her first book and was shortlisted in the 2018 Tessa Duder Awards for an as yet unpublished YA manuscript. Two of her novels for young readers have been listed as Storylines Notable Books and she is excited to have a new junior fiction title coming out in 2019. Her collection of flash fiction Where Oceans Meet is also due out in 2019 with a UK publisher. One of the stories from this collection recently won the Australian CLA Meniscus Best Prose Prize.